Snowy mountains of musical festivals started out as a small musical event back in 2009 at perisher valley. The snowy mountains festival back then was a miniature event with the potential of growing to become one of the most successful music festivals. Five years down the line in 2013 and the music event was phenomenal. The festival has brought alive a couple of good musicians who’ve been there fro009m. the start. And with each growing year, new talented musicians have been joining in the group and showcasing their talents alongside successful Australian musicians. 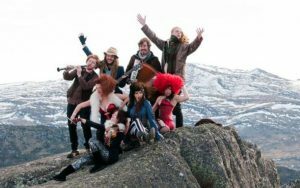 Snowy mountains of musical festivals is a great family getaway event with something for everyone to do and enjoy. Party late into the night with some solid beats, some acoustic beats around the bonfire and for the kids, there’s plenty of good songs and sounds and puppet shows to enjoy. With a variety of activities to engage in, you can sing along to the song’s lyrics, scream at the top of your lungs and feel the music and beats warm up your heart and dance to the rhythm. Enjoy new world flavors and musical programs lined up for you. If you aren’t the musical person, you can alternatively enjoy a good time in snowing activities such as skiing. From 2014 to 2016 the festival was held at Thredbo in the natural amphitheater close to the Kosciuszko National Park. In addition to the live performance, the snowy mountains is a stunning background and spectacular alpine sceneries for the viewers and performers. With the return of the country music to the snowy Australian mountains in 2016, it was an event to be spoken about. With an incredible line up of performing artists including Kip Moore and Kelsea as well as the legend of Aussie music, Daryl. Thredbo was happy to host the event. If you are passionate about outdoor events and activities, the music festival has proved to be a great experience for such. With available accommodation at affordable prices, the festival is worth your spend. Music is food to the soul. With top country musician celebrities being the heart of the festival, snowy mountains of music festival has been tremendously growing successful. A four day weekend fun filled festival with a well-organized performance program from day to night, it is the must attend festival on the snowy mountains. Aside from enjoying the sound of the musical instruments and the sweet charming sound of the musicians, attendees will also have fun hiking, biking and horse riding as well as fishing at the nearby tourist attraction sites i.e. the mountain and rivers. The festival was created as an act of promoting the Australian snow season as well as enhancing new talents from far and wide and also in Australia. With over 45 acts and 150 concerts across various venues, the snowy mountains of music festivals it is a worthwhile experience that leaves you craving for more. Having been there for the past 7 years, those who have grown fond of the event eagerly awaiting the next great snowy mountains of musical festival to be held in 2017.